This item is also available at my Etsy store. You don't have to be a PayPal user, you may use Credit Card for payment. With help of technology, I finally am able to write this step-by-step guide without struggling too much on capturing the work flow and worrying that there's not much details left to show. This tutorial is composed using 58(including coverpage) high-resolution pictures, all steps and procedures are zoomed and focus to deliver the precise instruction via a set of terrifically clear pictures. In this document, it also listed out the tools and materials used to achieve this composition. The tutorial will walk you through the entire process of creating this FISH design. 2. Attach a chain on the core wires so that you will have space to attach beads. So what so special about this technique? The essential part about this design is - the knotting itself will create a whole stretch of tiny holes that's technically, would allow a 30ga wires to go through it TWICE. Knowing that 30ga wires are widely used for bead attachment, this technique will be very useful for your jewelry creation. You are able to preserve the originality of your design, and add texture to them for richer finish. You can also pay for the tutorial via PayPal by sending 9.95USD to decors.l@gmail.com by specifying "DCH009 FISH" in the title of the transaction, or click on the Add to Cart button to purchase. The PDF file will be sent to the e-mail address set in your PayPal profile. PLEASE DO NOT LEND TO OTHERS, SHARE AMONG FORUM, SHARE AMONG FRIENDS, COPY AND MASS PRODUCE THE DESIGN OUT OF IT. 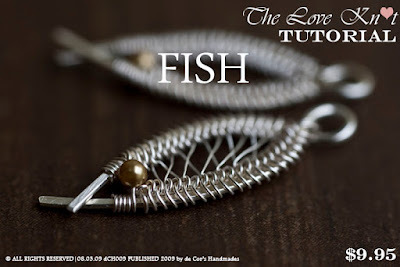 And if you would be so kind, please give a credit to me if my tutorial inspired you or helped you in your jewelry making journey, it would be greatly appreciated! You my dear are a talent power house! I am not only routinely impressed by your skill but also by your creativity!! !